Galileo's discoveries opened the age of astronomical enlightenment four hundred years ago. Our club honors the memory of Galileo, believed to be the first astronomer to use a telescope. He made a great many discoveries in astronomy and in other fields, yet he faced the Roman Inquisition and was declared a heretic. Galileo Galilei (15 February 1564 – 8 January 1642) was an Italian polymath. Galileo is a central figure in the transition from natural philosophy to modern science and in the transformation of the scientific Renaissance into a scientific revolution. Galileo's championing of heliocentrism was controversial during his lifetime. He met with opposition from astronomers, who doubted heliocentrism because of the absence of an observed stellar parallax. 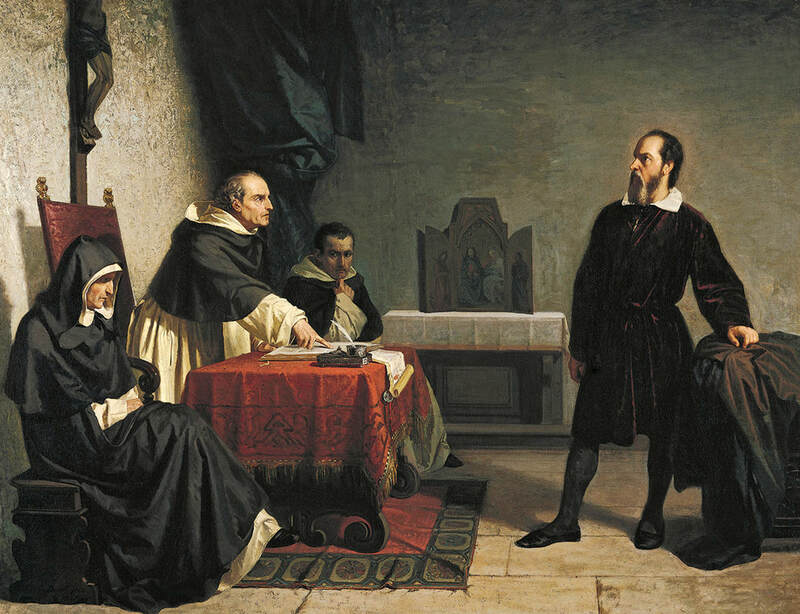 The matter was investigated by the Roman Inquisition in 1615, which concluded that heliocentrism was "foolish and absurd in philosophy, and formally heretical since it explicitly contradicts in many places the sense of Holy Scripture." He was tried by the Inquisition, found "vehemently suspect of heresy", and forced to recant. He spent the rest of his life under house arrest. His contributions to observational astronomy include the telescopic confirmation of the phases of Venus, the discovery of the four largest satellites of Jupiter, the observation of Saturn's rings (though he could not see them well enough to discern their true nature) and the analysis of sunspots. According to popular legend, after recanting his theory that the Earth moved around the Sun, Galileo allegedly muttered the rebellious phrase "And yet it moves".